Hilariously my very first tip actually has very little to do with kids and has everything to do with coffee and bars! Basically if you want to save a cent or two always order and drink a coffee at the bar in a Parisian café, not on the terrace. The price on a terrace can be more that double than the one if you sit by the bar. The same goes for most drinks. (By the way: a café is an espresso, a noisette is a macchiato and a crème is a cappuccino roughly speaking). 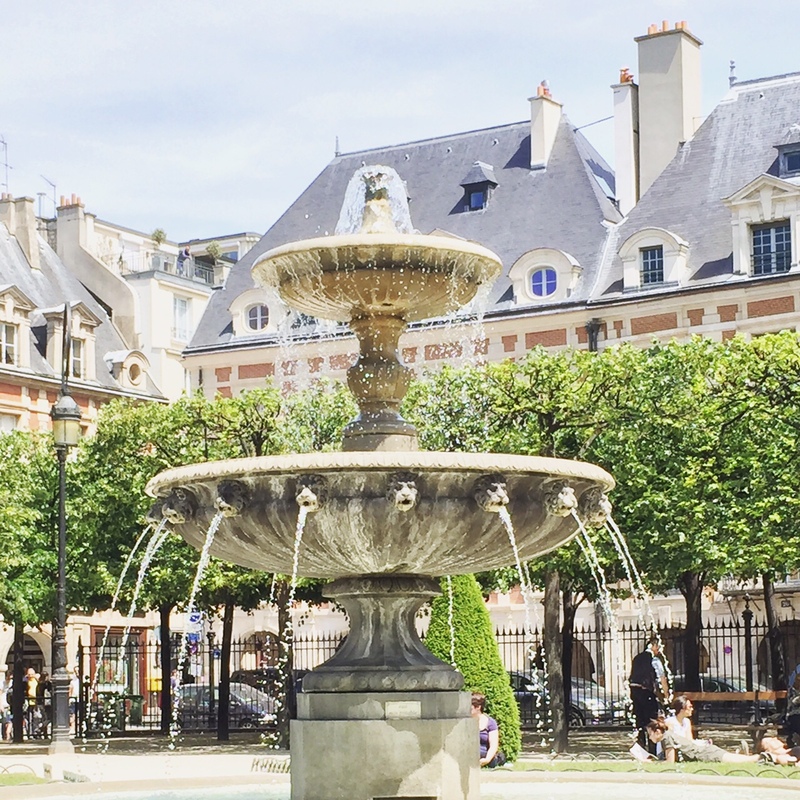 All neighbourhoods in Paris have little squares with play equipment (like place des Vosges on the photo above). They are simple, easy going and a nice way to get away from the crowds. If you are looking for a real park, go a bit further afield and head over to the Buttes de Chaumont, which is super French and has grassy areas, so a good place to go and kick a ball around. My favourite Parisian street food is good old-fashioned crepes, and you can still find a lot of little hole-in-the-wall crepes stands that will throw together a “jambon-fromage-champions” (my personal favourite). My kids absolutely love them. In restaurants do ask for a kids menu, even if it is not advertised. Especially less touristy places will often happily make a smaller plate for kids. If you have the time to teach your kids just a few words in French, it is totally worth it. I have seen the sternest French waiter melt when he had been addressed in French by a little foreign tourist. Even “Bonjour”, “Merci” and “S’il vous plait” is enough. When you ask for anything, be it a baguette in a boulangerie or directions on the street, start with “Bonjour” not “Excuse me”. It just the way we start a conversation over here. If not you might finish with your questions just to have a pointed “Bonjour” thrown back at you. For me the best way to get around Paris, if you have a bit of time, is by bus. They use the same tickets as the metro, but are so much more pleasant and such a great way to see the city. The free public transport app is unfortunately only in French at the moment, but it is so easy to use that I think you could use it with even the smallest knowledge of French. If you have even more time then the very, very best way of getting around Paris is to walk! Paris is much smaller than London and New York so it is actually easy to walk from one attraction to the next. On the left bank of the Seine a lot of the quays are closed to cars and are a lovely way to discover Paris. On Sundays the right bank of the Seine is also closed to cars. As we now all know, French Kids don’t throw food 😉 which is actually only partly correct of course. But it is true that people expect children to behave in restaurants and will ask the waiter to ask you to be a bit quieter. Do not take it personally as it happens to French parents as much as it does to foreigners. I try to smile and apologise and that normally does the trick. As I mentioned, this is a bit of a random list, but these are some of my top tips to visiting Paris. If you have any questions, I will do my best to answer them!